1. Whole Milk (Berkeley /Organic /Strauss ) – 1700 ml ( 7 cups) approx. 1. 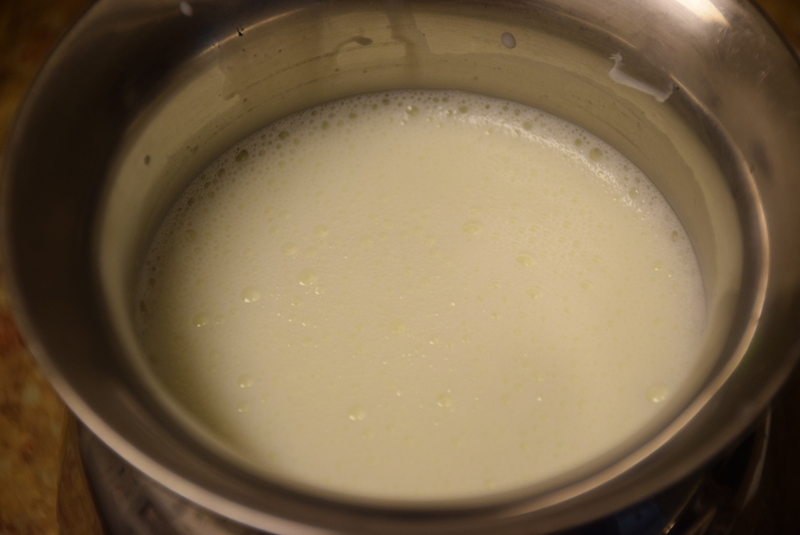 Take the milk in a pan and bring it to a boil. You may just halve or take just quarter the quantity if trying for the first time. For 1 liter milk you need just 1 tsp of starter yogurt. 2. 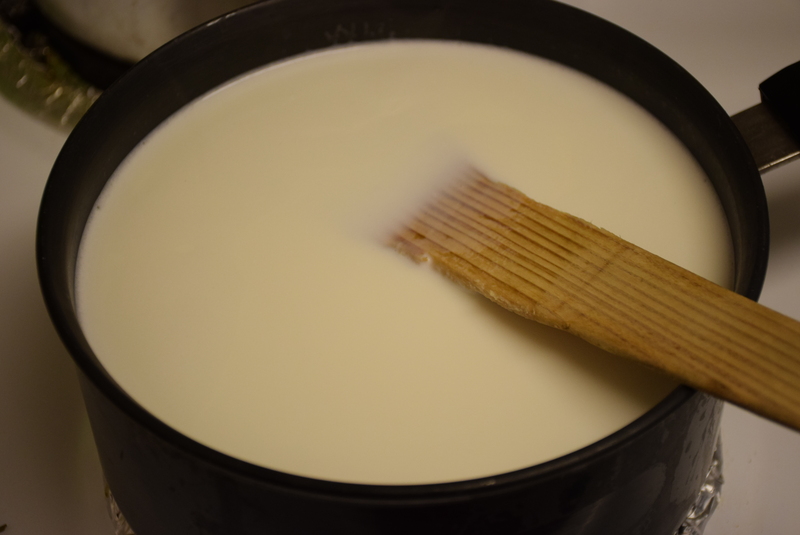 Remove from the stove-top and place the pan on the counter to bring the milk to just lukewarm condition . If measured on thermometer it should be between 110 degree F to 118 degree F. It should be just warm to touch , not burn your hands. 3. 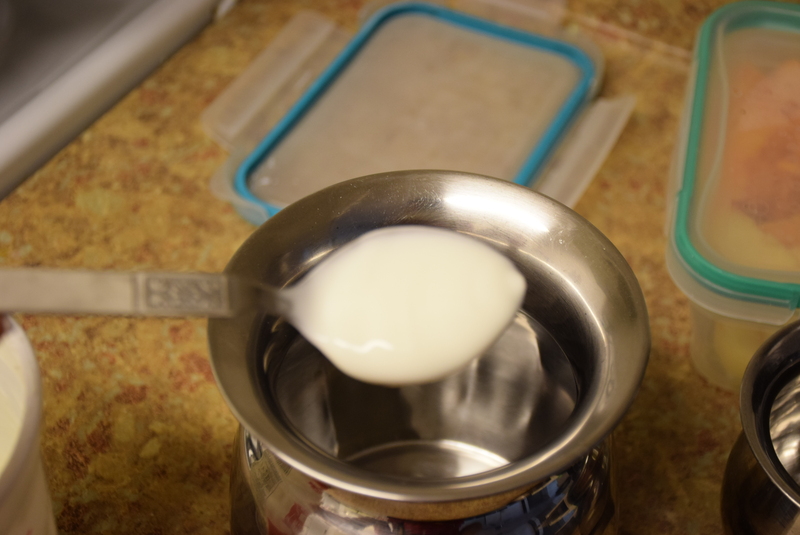 My milk got cooled down in about 75 mins (it depends on the quantity of milk taken). When it reached 118.5 degree F, I added the starter yogurt in the respective Steel Lota(Buta/Burbot) and then the milk and give it a nice stir. 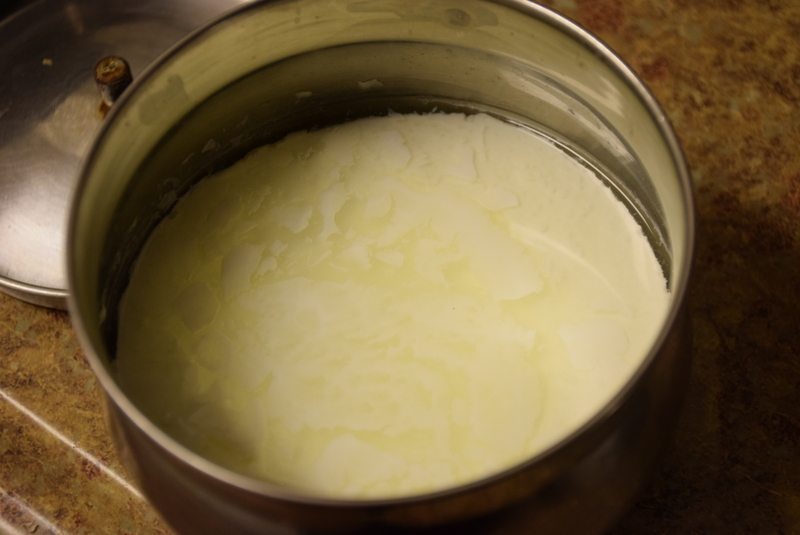 Alternatively , you may pour back the milk with starter in the pan , from the pan to the Lota and back and forth 3-4 times to enable good mixing of the starter yogurt. Hence I started at little higher temperature, because this brings down the temperature faster. 4. 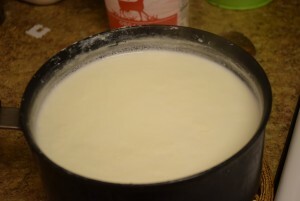 You may simply stir the started yogurt in the milk after adding to the lota. 5. Cover them instantly with a plate or lid. 6. Keep them in a warm place in your kitchen . I prefer keeping in the oven, with its light on. 7. Let it sit in that warm place for 4 hrs undisturbed. 8. I took them out after 6 hrs, and see my yummy curd is ready to devour. If you don’t like the sour taste , you may add 1/2 tsp sugar in 1 liter milk with starter yogurt. Or you my take it out after 4 hrs and then refrigerate. 9. 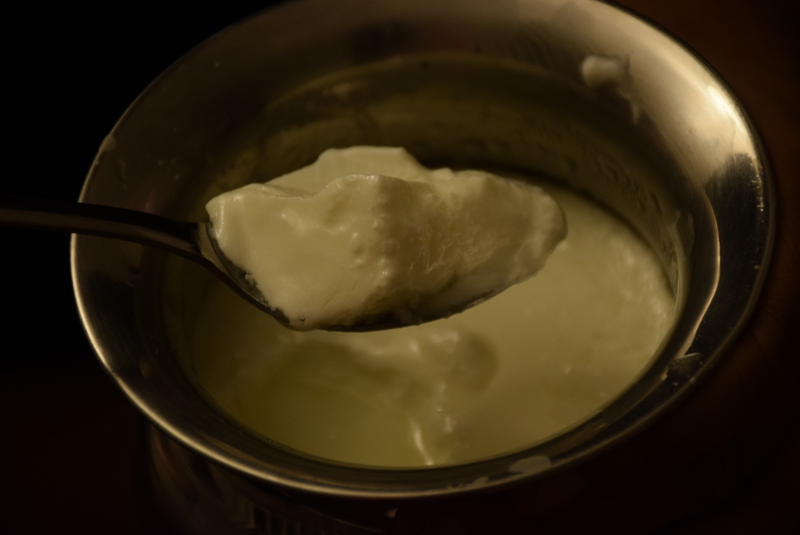 But yes, how do we know that our curd is set? 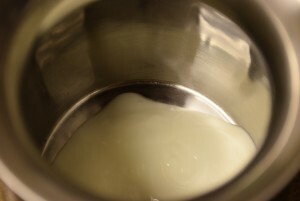 For this, just gaze at the top layer of the curd. If you could see some greenish water floating on it and while taking out you could feel it is a mass, not a liquid, it is set. 10. 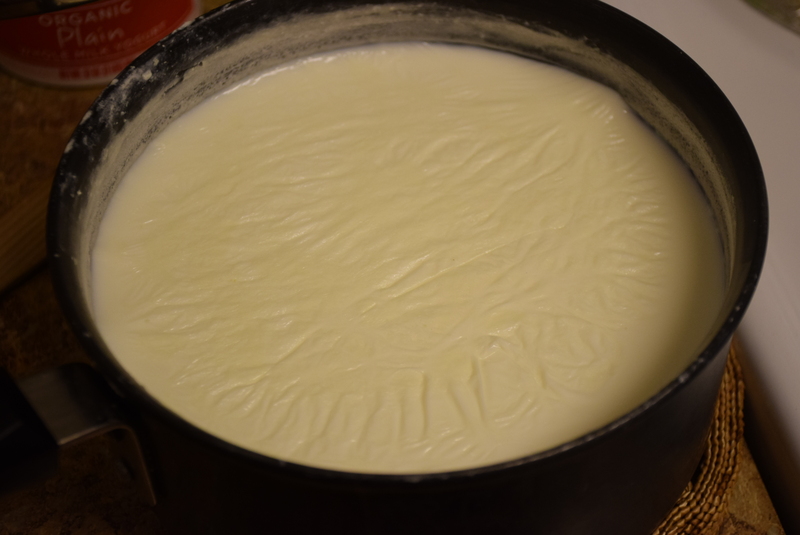 What if the curd doesn’t set even after 7 hrs? 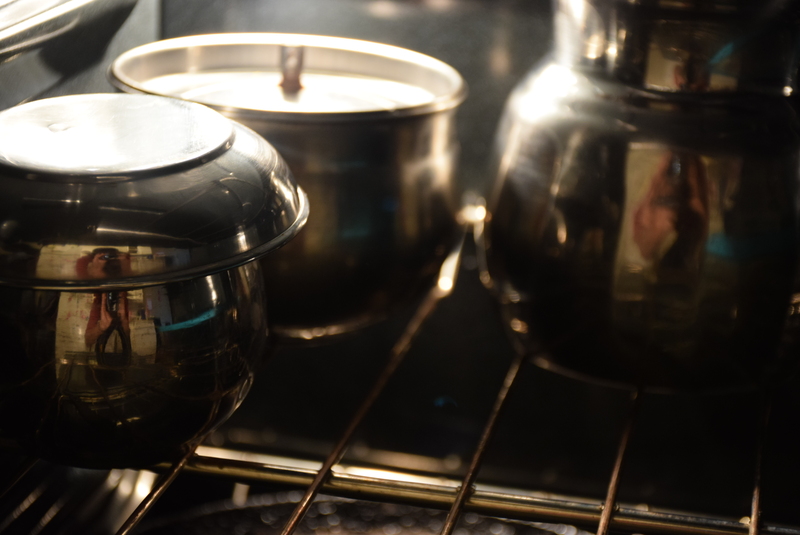 i)Take out the lotas, preheat the oven to the lowest temperature i.e. 200 degree F for 2 mins. Turn it off. Keep the vessels wrapped in towels again for an hour. 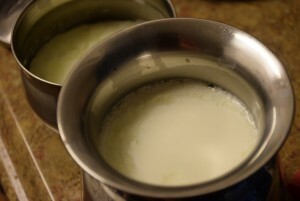 ii) Or warm 2 cups of water in a pan. Place the lota (1 liter) in it for 30 mins. This curd remains fresh for a week after it is set. I really like its taste, texture, cut-in types, and is good for making a variety of recipe like fried idli, kadhi pakora, bhatura, tawa kulcha, buttermilk,etc. 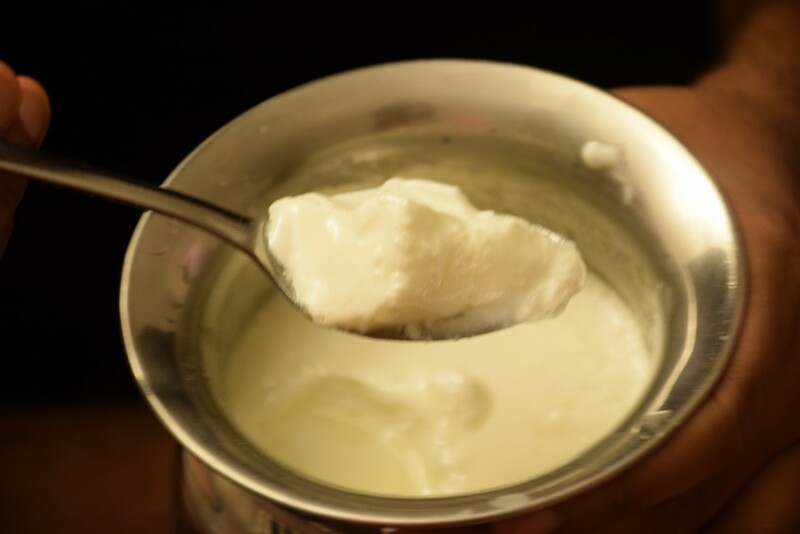 This entry was posted in Food, Kids- Favourite, Raw preps, Recipes and tagged 110 Degree F, 118 Degree F, bhature, buttermilk, Carenshare, chaach, curd, dahi, gatte ki sabzi, home-made, idli, kadhi, kulcha, lukewarm, milk, naan, organic, shweta jindal, starter, straus, whole milk, yoghurt, zindagisikhati.